These cookies are made flourless, dairy butter-free and no refine sugar. Now, when I say no-bake, they still have to be closed to baked cookies! And pay close attention to ingredients, I prefer to use quality organic ingredients(See below). They are all super quick , easy, delicious, and allow you to skip the oven. No Bake Cookies come together in a matter of minutes without turning the oven on. They’re quick, delicious and sure to be a big hit! 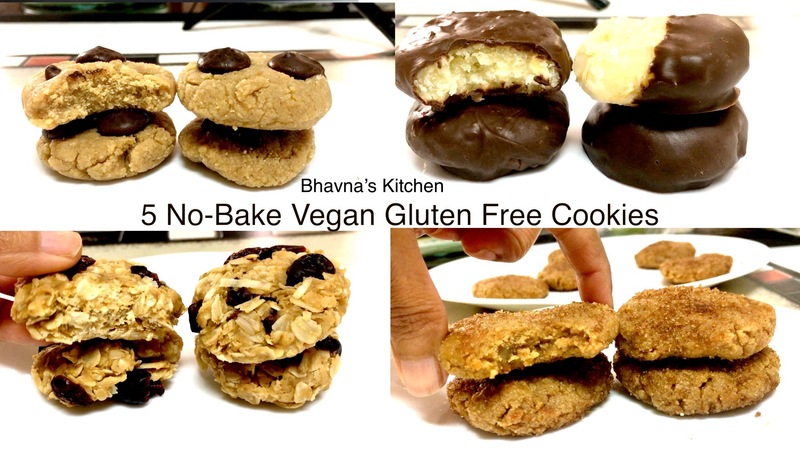 In this post, I am going to share basic ideas of making no-bake, vegan, gluten-free cookies and I will keep on posting as I explore more! From this post itself, I am sure you will get lot of ideas. For individual cookie recipes, please visit the recipe pages. These no bake cookies are seriously delicious and can be made quickly. My first favorite is oat cookies, second- pineapple coconut (Pina Colada), third-chocolate chip and fourth-Ginger cookies. I do make vanilla for my younger son but I am not so much into vanilla cookies and I think I still have to become perfect on those vanilla cookies. I recommend to use almond meal(Flour) instead of grain flour, replace refine sugar with natural sugar like honey, maple syrup or raw sugar, preferable organic nut butter and so on. For more healthier incorporating in cookies, add golden flax meal. So I call these cookies superfood as I use above ingredients. And if you are looking for after workout cookies, feel free to add protein powder. I also love to make spiced cookies with ginger powder, all-spice, candied ginger and so on. I simply love to bite on those soft chewy ginger and chocolate chip cookies.